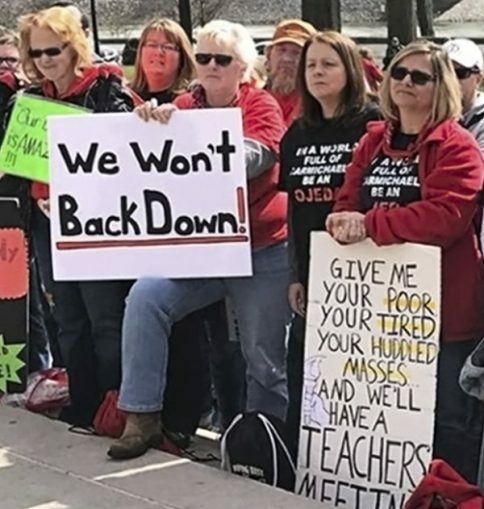 UPDATE, MARCH 6: After nine consecutive work days out on strike, West Virginia’s militant teachers and school staff faced down a right-wing governor and legislature to win a 5 percent pay raise, not just for themselves, but for all state workers. They had vowed to stay out until they won. The bill authorizing the raise passed the House and Senate and was signed by the governor this afternoon. Teachers and staff are likely to return to work March 7 but the possibility of renewed action remains, especially in relation to health insurance funding. To continue to follow workers’ struggles in the state, including Frontier workers represented by CWA, still out on strike, go to FB: WWP West Virginia – Strike Support. Education workers were still out on the picket lines at the end of the day, continuing their historic statewide strike for better wages, as well as blocking health care takeaways and other union-busting attacks. West Virginia ranks 48th in the U.S. for teacher wages — teachers earn less in only two other states. Starting pay is around $32,000 a year, and teachers with families must often apply for food assistance. The strike in all 55 counties, which began Feb. 22, will continue indefinitely until the state Senate passes a bill granting state education workers a 5 percent raise. On Feb. 28, the House approved the 5 percent pay raise, which billionaire Republican Gov. Jim Justice approved in talks with the three unions the day before. But on March 1, the right-wing Senate proposed taking away the pay raise and diverting it toward supposedly “fixing” the health insurance plan. The legislature must believe the workers will fall for this as if it’s a magic trick. This capitalist fakery only made the workers angrier. Members of both the House and Senate are heavily influenced by the coal, oil and gas company owners of West Virginia. For three days, including a Saturday when a special session was called, the Senate failed to pass the 5 percent raise. Then they tried to substitute a 4 percent raise under the cover of giving it to all state workers. The three unions are the American Federation of Teachers-West Virginia, the West Virginia Education Association and the West Virginina School Service Personnel Association. A Senate clerical error actually endorsed the 5 percent increase briefly before pro-business senators rushed to erase the raise. One striker’s social media comment was that the legislators seemed to need a teacher to help them check their figures and their draft language. The strikers’ impact was felt early when the governor approved, and the Republican-majority House passed, the pay hike. The governor had to back away from pushing bills that gutted seniority, promoted charter schools, prevented unions from deducting union dues from members’ paychecks, and would expand “Teach for America” — a program that hires new college graduates without teaching degrees at a lower rate of pay. These types of bills are part of a national anti-union campaign funded in part by the far-right billionaire Koch brothers. The governor’s offer did not create a permanent fix for the Public Employees Insurance Agency, only proposing a temporary “freeze” on health care insurance premiums and a “task force” to find more funding sources. However, the worst legislative changes to PEIA, mostly various excuses to raise premiums, are paused for the time being. The strength of what is essentially a general strike of education workers was demonstrated March 2 when 45 county school superintendents told Republican legislators that schools would stay closed until the 5 percent increase passed. Now all 55 superintendents have taken that position. Under state law, public sector strikes are illegal, but West Virginia workers know labor history. The Battle of Blair Mountain in 1921 in Logan County was the largest labor uprising in U.S. history, with 10,000 armed coal miners confronting 3,000 police and strikebreakers. Throughout the 20th century the United Mine Workers was a mighty force, with wildcat strikes common, including thousands during the 1970s. Some strikers are wearing the red neckerchiefs that miners wore during the 1921 revolt. On Thursday, March 1, the workers defiantly began their second week on strike. One union member told WW that most strikers want big businesses, especially Big Oil, taxed at a higher rate so the state can pay education workers better wages and benefits. On March 2, 3 and 5, militant rallies drew thousands to the state capital, Charleston. On March 2, hundreds of students marched to support their teachers, holding signs and chanting, “Teachers stand for us, we stand for teachers.” They have joined teachers in occupying the Capitol building interior for multiple days. Unions benefit everyone. Their structure offers combat assistance, resources and organizational communication. Unions enable members to connect and build militancy from the ground up. While worker anger has been widespread at top union leaders, who appeared ready to end the strike prematurely, strikers are reacting positively to the unions’ official announcement that the walkout would continue until the 5 percent raise becomes law. They fought to have unions and they are fighting to make them fight. Teacher and union activist Phil, demonstrating at the Capitol building on March 1, told WW: “There’s been lots of anti-union talk from ultra-left and conservatives. Folks need to fight within their unions, to make them more progressive and class conscious. We need to radicalize and transform unions from within at the local level. Despite failings in upper-level leadership, the union is not the enemy. The enemy is the billionaire capitalist class! Tremendous solidarity has come from other unions: Teamsters, Mine Workers, Communication Workers and even unions in other countries. More solidarity messages have flowed in, including from the Boston School Bus Drivers Union, United Steelworkers Local 8751; Harvard TPS Coalition, a group of union cooks, custodians and clerical workers at Harvard University supporting immigrant workers losing temporary protective status; and New York-based Parents for Improved School Transportation. The West Virginia example is already being followed. About 1,400 members of the Communication Workers in West Virginia and Ashburn, Va., walked out March 4 at midnight and are striking Frontier Communications. Many of them were learning about strikes by picketing alongside teachers. They are fighting for job security as Frontier has eliminated 500 jobs since acquiring Verizon landlines in 2010. The world is watching the class war in West Virginia. Power to the rank-and-file union members directing their burning anger against the viciousness of the capitalist system! Otis Grotewohl contributed to this article.